Sometimes you have to take what you can get, and Wednesday night's TV on the Radio show was a prime example of that. Post-rap group Subtle warmed up the crowd, but were more annoying than entertaining due to the antics of their lead singer/rapper who had a penchant for distracting theatrics and extremely forced stand-up comedy. There's a fine line between clever and stupid, but pantomimed throat slitting with a switchblade, throwing plastic forks into the crowd, and attempted self-mutilation with said plastic utensils strays exclusively to the 'stupid' end of that spectrum. The sad part of it is, the instrumentation was far superior to the contrived stage antics and probably would have been invariably more entertaining if not for all the shtick surrounding it. 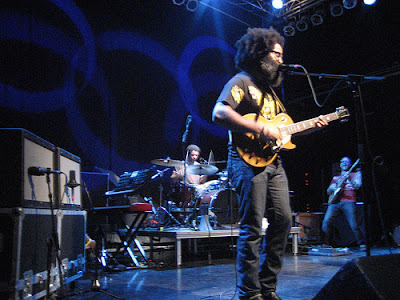 TV on the Radio fared far better, hitting the stage and immediately breaking into a rendition of the anthemic "I Was a Lover" in front of a sold out house. The night was split pretty evenly between songs from their most recent record, Return to Cookie Mountain, and their 2004 release Desperate Youth, Blood Thirsty Babes. Lead singer Tunde Adebimpe and guitarist/producer David Andrew Sitek positively exuded energy for the first 20 minutes or so, but right after the high energy romp of "Wolf Like Me" things seemed to die down. It might just have been my unfamiliarity with their earlier material, but I doubt I was the only one who found much of the middle of their set to drag. The end of the main set was redeemed by "Dirtywhirl" and a human-beatboxed version of "Province". The set seemed short, clocking in at a little under an hour, so an encore was almost a given.